Coca Cola and SuperBowl 2015, a MIssed Opportunity? | adaptifyed™ The Adaptifyed system for monetizing downloadable files is covered by U.S. patents: US9451011B2, US14318109, US15243350, and pending application: US20150007256A1. For the 2015 Super Bowl, Coca Cola spent $4.5 million to tell the world to be a little kinder to each other. Their message? The Internet can be used to spread either happiness or hate. To either hurt someone or make someone’s day. At the end of the day, it’s whatever we make it. 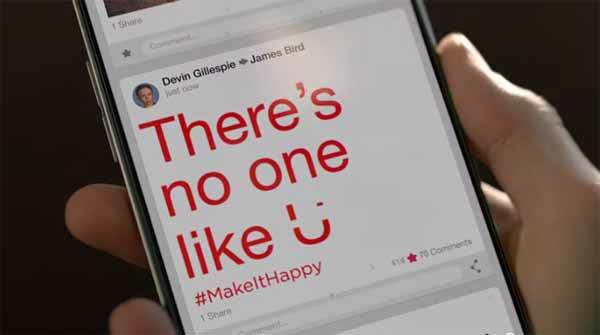 Let’s #MakeItHappy. However, if they had thought outside the box they might have had a really unbelievable effect on the lives of people. In another post I discussed the statistics that Rocket Fuel posted comparing the cost of the standard 30 second Super Bowl ad for 2015 at $4.5 Million and the cost of an Internet takeover during the game at $3.8 Million. Just think of the possibility… If CocaCola had taken over the majority of the ad placements during the game, used the excess to give grants to students around the country (or the world) to create ads that dovetailed with their #MakeItHappy campaign, like the #rethink campaign to stop cyber-bullying that they are already backing, leveraged some government money in the form of grants that is also trying to make an impact in the fight against hate on the Internet, and then run all of those messages across the Internet for the length of the SuperBowl game… now THAT would have been amazing! Would it have taken more than $4.5 Million? Yes, I’m sure it would have, however, they could have leveraged funds available through other organizations. CocaCola could have partnered with nonprofits, government agencies, universities, and film schools, and online platforms, and actually have facilitated the first meaningful step in how a generation uses the Internet. In a world of sissies and losers, this commercial garners applause. this easy. We clean up the Internet one post at a time.